The Jagdterrier is primarily a working terrier, however it is more versatile than most terriers. Aside from being used to go to ground it can also track and retrieve. In Germany it is used to hunt a wide variety of prey such as boars, badgers, foxes and deer. While in the United States it acts as a treeing dog to hunt raccoons and squirrels. After WWI a group of German hunters broke off from the German Fox Terrier Club to create an improved hunting terrier. 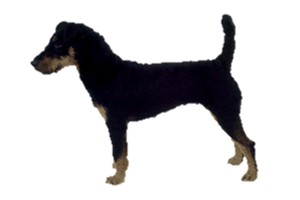 A large number of different terriers were used in its makeup, such as working Fell Terriers (similar to today's Patterdale Terrier), Wire Fox and Welsh Terrier. The native German Pinscher may also have contributed to the early bloodline. Is the Jagdterrier Right for You?